Personal injury law and jury trials are very difficult and require a lot of work and skill. It can be very stressful. It is very serious work that should be taken seriously. When an attorney is lucky enough to be trusted by someone or their family for a loss they sustained, you understand how important personal injury cases can be. If you have to take their case to a jury trial, in effect, a personal injury lawyer is defending their constitutional right to a jury trial as well as defending their rights to fair compensation for injuries. If you have been injured in any type of accident where someone else or some company caused you to suffer pain and suffering or mental anguish you need a personal injury trial lawyer. There are a lot of “lawyers” who claim to handle personal injury cases. However, a lot of times, these lawyers are not trial attorneys or they do not concentrate specifically in handling accident cases. While they may be qualified to get you a quick low ball settlement they may not be able to take your case to trial and to get you full compensation. Anything less than full justice is injustice. 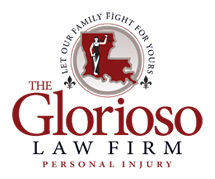 At The Glorioso Law Firm, we pride ourselves on being personal injury trial lawyers. This is what we do and who we are. Our entire practice is focused on representing injured people. Every case we accept we take serious. When you hire the Glorioso Law Firm you are getting experienced and committed personal injury trial attorneys. We strongly believe that getting every case ready for trial and being willing and able to go to trial leads to respect from our opponents and in turn leads to better settlements. If cases aren’t being negotiated fairly or settlement is impossible we have no problem going to trial and fighting for you or your family. As personal injury trial lawyers, we do not get paid unless you get paid. Also, we will put up all of the litigation costs involved in handling your case and getting you the result and compensation you deserve. We take injuries and injustice very serious. When you know that your opponent, usually a big insurance company, will try and do anything to stop from having to compensate your client, you understand that you must be devoted to handling personal injury cases. Big insurance companies hire big defense law firms that have very smart attorneys and they spare no amount of money to defend a lawsuit. At the Glorioso Law Firm, we know all of this all too well and we have committed ourselves to fighting the big insurance companies and big firms for our clients who have been injured. If you have been injured in a car accident, truck accident, slip and fall, trip and fall or medical negligence or any other type of accident, please call The Glorioso Law Firm. We have handled thousands of injury cases in New Orleans, Metairie, Kenner, Covington, Mandeville and all across the great State of Louisiana. We have represented clients from all over the world. Very often we get hired by an out of state client who was in town for something and they were injured by someone else’s fault. We always hate to hear when someone visiting New Orleans, Metairie or any other city in Louisiana gets seriously injured. If this has happened to you, you will need a committed and experienced Louisiana personal injury trial lawyer. Please call The Glorioso Law Firm for a free case evaluation.